Baby Boy the dog was found nearly dead in a front yard garden. He had been doused with chemicals and abandoned — and we have no idea who did it. Sign on to ask local authorities to find whoever did this to Baby Boy, then charge and prosecute that person to the full extent of the law. It's very lucky that Baby Boy fell into the hands of Jami Hirstius, who works at the local shelter. She said he looked resigned to his death when she found him. She then scooped him up in a towel and rushed him to get help. He had chemical burns all over his body and face and was in severe pain. 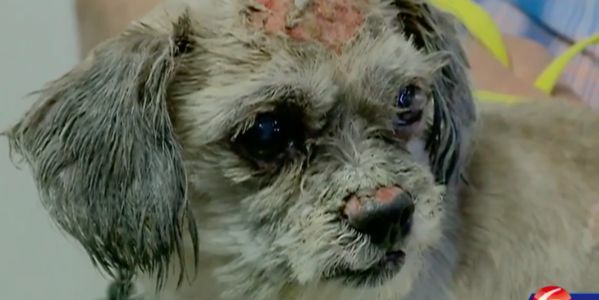 The burned skin is peeling off and, though Baby Boy is on his way to recovery, he suffered greatly and will deal with the results of this abuse for the rest of his life. Whoever did this is truly a monster. Not only did they harm this sweet dog, but they abandoned him to die slowly and painfully. We must insist the person responsible is found and punished. We must make it known that we will not tolerate this animal cruelty as a society. Please sign to demand justice for Baby Boy.